'Thank you for being part of our special day... you truly were amazing!' - Tom and Sarah, Kelham House Hotel, Newark. 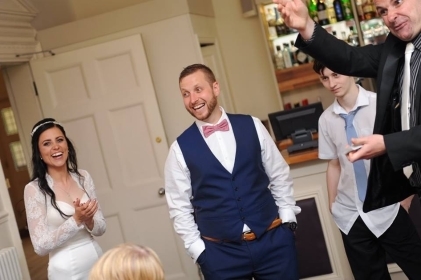 Traditionally, David Fox performs his brand of mix-and-mingle mystification during the drinks reception/photograph period, or the early part of the evening reception (from the end of the speeches until the first dance). However, not all weddings will follow a standard format. 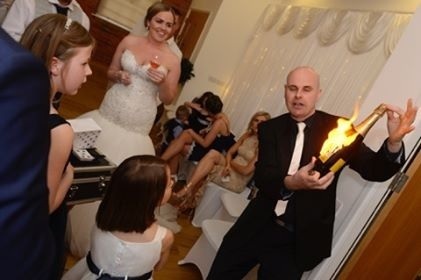 David Fox has been very fortunate to have entertained wedding guests in all sorts of interesting locations over the years from theme parks to zoos and haunted castles! Every couple has their own idea of what they want for the big day and David will always be flexible and ensure his performance compliments your schedule. As well as being a close-up magician, David Fox is also an outstanding parlour/stage performer. At many weddings in the past he has been asked to perform a show for all of the guests - normally in conjunction with his close-up magic. This is very special, and he will tailor the overall performance to suit the bride and groom's wishes. Customised effects can also be created at your request. 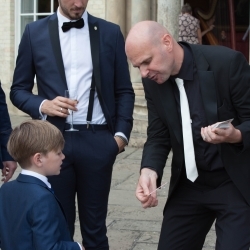 With an extensive knowledge of the magical arts at his disposal, David Fox always revels in the opportunity to develop a particlar trick, effect or routine for your wedding day! 'Our guests were amazed and you really helped to make the day!' - Steven and Nichola, Rufford Mill, Nottinghamshire. 1. David recently won the title of the 'The Most Popular Magician' in the Wedding Industry Experts poll. He received more votes than any other magician in the world in his field. This was a stunning endorsement of his outstanding performances and people skills. 2. As a member of the prestigious Magic Circle, David's magic has to be seen to be believed. He creates his own unique effects, routines and illusions which are guaranteed to enthrall everyone on your wedding day. 3. As well as being a natural entertainer, David is very friendly and engaging. He possesses an uncanny ability to relate to people from all backgrounds and make them feel secure and relaxed in his presence. 4. Being a member of Equity, David Fox has full public liability insurance which allows him to perform at the most prestigious venues throughout Nottinghamshire and beyond. 5. Will there be children at your wedding? If so, David Fox enjoys working with all age groups and will ensure that everyone is included from the youngest guest to the grandparents.